Soldat is a side-scrolling multiplayer shooter game. 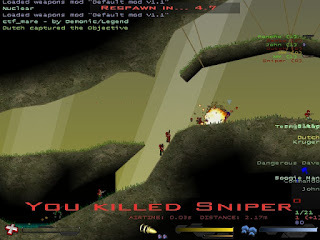 Players can choose from a variety of weapons, and play different game modes including the classics--Capture the Flag, Deathmatch, and Team Deathmatch--as well as unique modes such as "Rambomatch." With an active online community, you can find new maps, mods&scripts, and servers easily. For my first review I decided to start with a classic. Soldat is a game I used to play all the time, and I'm glad to see that it's still alive. This game is fabulous. To FPS fans, playing a 2D, side-scrolling shooter may seem odd at first, but don't worry--this game has all the killing-people-blowing-stuff-up action you crave. Oh wait--did I mention you have a jetpack? By right-clicking, you can fly around the map, dropping death on your enemies from above! Jetpacks are awesome. Setting up a server for your LAN party is pretty easy. You can choose all the options in-game, and then simply start the game. For more advanced options, such as using scripts to modify the gameplay (Check out Pirates v. Ninjas), you can also download a command-line, dedicated server program. If you're not LANing, Soldat also has an active online presence, and joining an online server is easy. Simply choose "Internet" as your source, and hit "Request Servers." Then pick one and play. New players be warned: some people are really, really good at this game! Don't be surprised if you get pwned at first. All in all, Soldat is a great time, and sure to be a blast at any LAN party. I consider it an excellent game. Some of the customization features of the game require paying for a license. However, you can still get the full experience for free, and if you like the game, then you should definitely consider supporting it! So here's the links. Go download it. Let me know if you played Soldat at your LAN party, and if you like the review! Soldat, even the title Sold dat for me.